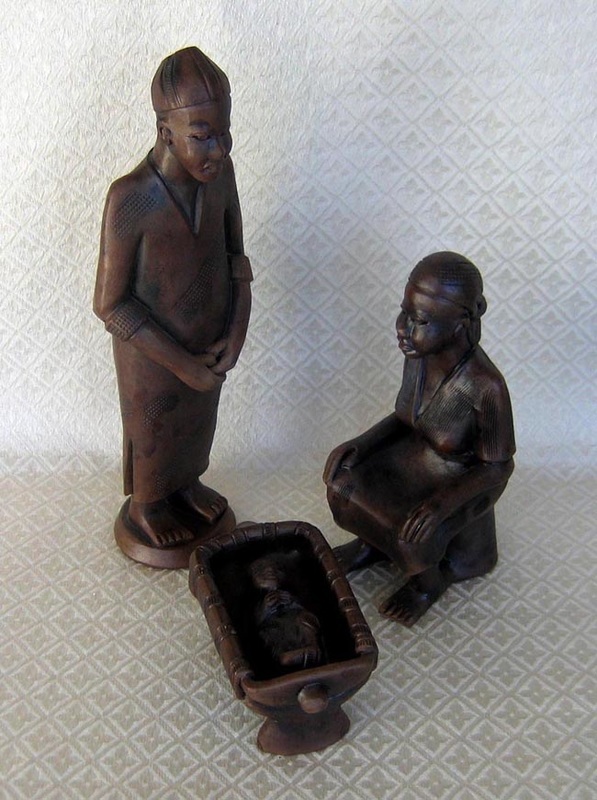 This native Holy Family is made of clay by artisan Alphonse Yenji in Cameroon. The clay is shaped, fired in a kiln, cooled, and then dipped into a dye from boiled eucalyptus tree bark to make the bronze patina. The standing Joseph figure is 13.5 inches high while the sitting Mary is 9 inches. The Presbyterian Handicraft Centre, known as Prescraft, was organized by the Presbyterian Church in Cameroon as a nonprofit organization to benefit disadvantaged craftspeople. Men and women produce traditional West African handicrafts including baskets, pottery, woodcarvings, brass castings and musical instruments. Artisans working at three rural production centers earn a good income based on piece work. Some artisans combine handicraft production at home with farming or trading. Prescraft provides employment for close to 800 artisans, 40 percent of whom are women.